Just realised the joys of woodworking? Or are you a regular Ron Swanson? No matter what skill level you are, you will need clamps! Without them, you are limited in the amount of jobs you can complete. If you’re in need of buying some, you’re in the right place. Read on ahead for some general information, tips and tricks and my picks for the best clamps for woodworking you can buy! Ok, this is a massive subject really. I could go on for pages about the different clamps, their uses and information about each. Instead, I’m going to give this information in some bitesize pieces; because, really, who wants to read an essay on clamps? Bar: This is by far the best clamp for beginners. They are versatile and will be suitable for a huge range of tasks; however, they can be expensive. Angle: One for the awkward projects where you’d need jigs made up. Useful for building cabinets and joinery. Strap: This is the clamp to buy for those annoying projects that have ridiculously weird angles to them. C: Another great clamp for beginners. 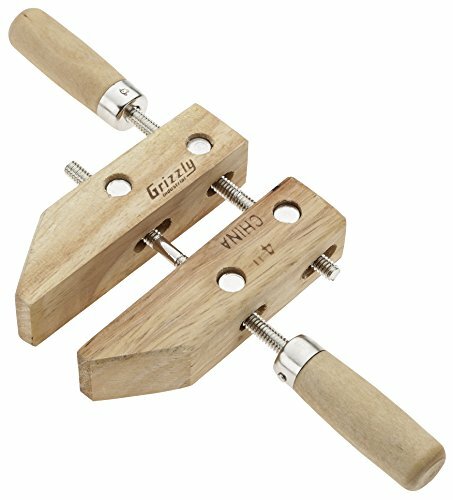 They are useful for a wide variety of woodworking tasks. Edge: The clamp to use when using circular saws or routers. Handscrew: A traditional tool used with cabinets. Biggest tip is to use the right clamp! It can be a big deal for a newbie to see all the varieties of clamps out there. It’s too easy to pick up the cheapest clamp and think that will do the job, It might, but you might end up damaging the clamp, or worse, your project. ​​Buy a few different clamps. If you can afford it, treat yourself to a few types. You will find it handy having some around, just in case a project needs it. ​Be careful when tightening the clamps. You can damage the wood, the glue can be squeezed out the joints and your project will look worse for wear. Research! This is a huge deal. You will always find an eager woodworker who just buys everything they see. DON’T. Always read up reviews first to make sure you’re getting a good deal and exactly what you need. Here we go everyone, my picks for the best clamps for woodworking! First up should, of course, be a bar clamp. The overall useful clamp that will suffice for a lot of tasks. 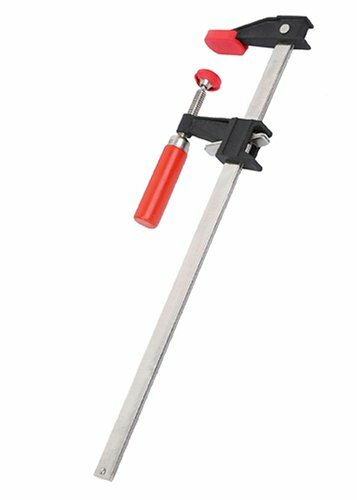 Bessey is also a relatively cheap clamp, which will suit almost all budgets. This is a medium duty clamp, which will allow for a broad range of jobs to be completed. Just don’t go hauling high weighted wood on this. 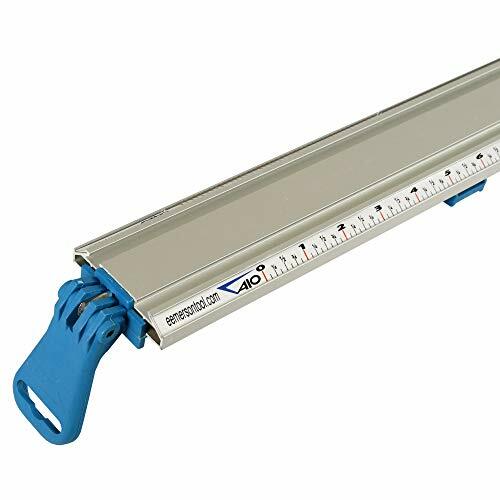 It measures at 24 inches long; be sure of what sized projects you will have in mind. The Bessey has a powder coated cast iron finish, 2 piece clutch plate system and has protective pads for the top and bottom jaws. Overall, this is a handy clamp to have in your arsenal; useful for beginners or those on stricter budgets. Next up is another clamp for all skill levels. This is probably the second most used clamp, next to the bar clamp. Shop Fox have produced a 6-inch aluminium item. The high construction quality allows this clamp to be lightweight, yet strong. This has a deep reach, with a 1 and ⅝” clamping capacity. The screw pad is made from non-marring nylon. This is more expensive, but well worth having. These right angle clamps are more expensive than others on this list, but they’re worth the price. Made from aluminium alloy; they are durable and will last for years to come. They are resistant to corrosion, easy to use and won’t damage delicate items you’re working with. 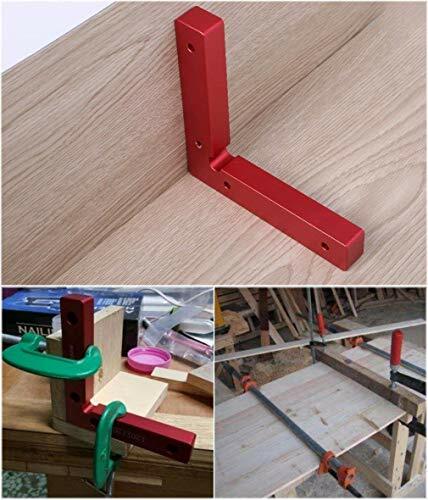 The Aiber clamps are to be used with woodworking projects such as boxes, cabinets, frames and shelves. They are easy to use, but you should have some woodworking skills before buying. 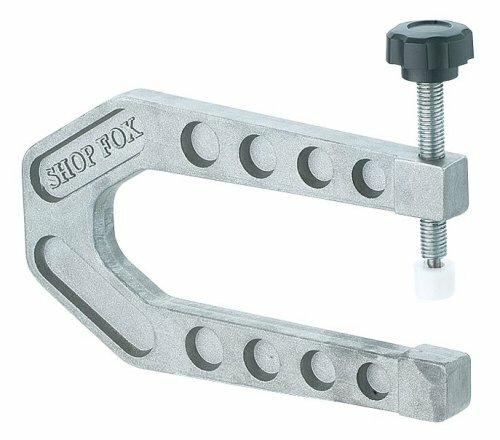 The straight edge clamp is the ideal tool to use in woodworking to gain that truly straight cut. This clamp has an extra wide rail and low profile to ensure obstruction free cuts. The length of clamping area between the jaws if approximately 50 inches. This, again, is an expensive clamp and should be bought by serious woodworkers or those with higher budgets. This clamp is great for cross cutting plywood, can use a router with ease and great for holding table-top glue in place. It’s operation is very easy to get to grips with. I really like this handscrew, mainly for it’s lovely, low price. It is a tiny little number, having a capacity of 4 inches. It is fully adjustable, with non-marring jaws which can be used for any number of small projects. No cabinet maker can be seen without a handscrew lying around. It’s light, cheap and easy to use; a great product all round. What Should I Clamp With? Think! Before you buy any clamp, you need to know what type of project you are undertaking. Picking the right clamp for the job is the highest priority. Overall, if I had to pick a winner, I would go for the Bessey bar clamp. It is an easy tool to use, has a great price and can be used for a large variety of jobs. This is the tool every budding woodworker needs to buy.